Insider Monkey finished processing more than 700 13F filings submitted by hedge funds and prominent investors. These filings show these funds’ portfolio positions as of December 31st, 2018. In this article we are going to take a look at smart money sentiment towards Atmos Energy Corporation (NYSE:ATO). Atmos Energy Corporation (NYSE:ATO) shareholders have witnessed an increase in support from the world’s most elite money managers lately. ATO was in 25 hedge funds’ portfolios at the end of December. 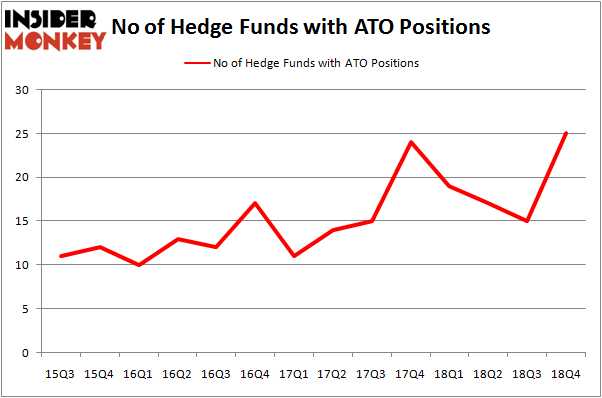 There were 15 hedge funds in our database with ATO positions at the end of the previous quarter. Our calculations also showed that ATO isn’t among the 30 most popular stocks among hedge funds. In today’s marketplace there are several formulas stock market investors have at their disposal to appraise stocks. A pair of the best formulas are hedge fund and insider trading signals. Our researchers have shown that, historically, those who follow the top picks of the top hedge fund managers can beat the broader indices by a healthy amount (see the details here). Let’s go over the fresh hedge fund action regarding Atmos Energy Corporation (NYSE:ATO). How are hedge funds trading Atmos Energy Corporation (NYSE:ATO)? At the end of the fourth quarter, a total of 25 of the hedge funds tracked by Insider Monkey held long positions in this stock, a change of 67% from the second quarter of 2018. The graph below displays the number of hedge funds with bullish position in ATO over the last 14 quarters. With the smart money’s capital changing hands, there exists an “upper tier” of noteworthy hedge fund managers who were upping their stakes considerably (or already accumulated large positions). Among these funds, Balyasny Asset Management held the most valuable stake in Atmos Energy Corporation (NYSE:ATO), which was worth $46.4 million at the end of the third quarter. On the second spot was Element Capital Management which amassed $40.9 million worth of shares. Moreover, AQR Capital Management, Luminus Management, and Carlson Capital were also bullish on Atmos Energy Corporation (NYSE:ATO), allocating a large percentage of their portfolios to this stock. Now, specific money managers were leading the bulls’ herd. Balyasny Asset Management, managed by Dmitry Balyasny, created the biggest position in Atmos Energy Corporation (NYSE:ATO). Balyasny Asset Management had $46.4 million invested in the company at the end of the quarter. Jeffrey Talpins’s Element Capital Management also made a $40.9 million investment in the stock during the quarter. The other funds with brand new ATO positions are Jonathan Barrett and Paul Segal’s Luminus Management, Peter J. Hark’s Shelter Harbor Advisors, and Greg Poole’s Echo Street Capital Management. Let’s now review hedge fund activity in other stocks – not necessarily in the same industry as Atmos Energy Corporation (NYSE:ATO) but similarly valued. We will take a look at Arch Capital Group Ltd. (NASDAQ:ACGL), Universal Health Services, Inc. (NYSE:UHS), Martin Marietta Materials, Inc. (NYSE:MLM), and CarMax Inc (NYSE:KMX). This group of stocks’ market values are similar to ATO’s market value. As you can see these stocks had an average of 25.75 hedge funds with bullish positions and the average amount invested in these stocks was $1267 million. That figure was $327 million in ATO’s case. Martin Marietta Materials, Inc. (NYSE:MLM) is the most popular stock in this table. On the other hand Arch Capital Group Ltd. (NASDAQ:ACGL) is the least popular one with only 13 bullish hedge fund positions. Atmos Energy Corporation (NYSE:ATO) is not the least popular stock in this group but hedge fund interest is still below average. This is a slightly negative signal and we’d rather spend our time researching stocks that hedge funds are piling on. Our calculations showed that top 15 most popular stocks among hedge funds returned 19.7% through March 15th and outperformed the S&P 500 ETF (SPY) by 6.6 percentage points. Unfortunately ATO wasn’t in this group. Hedge funds that bet on ATO were disappointed as the stock returned 10% and underperformed the market. If you are interested in investing in large cap stocks, you should check out the top 15 hedge fund stocks as 13 of these outperformed the market. 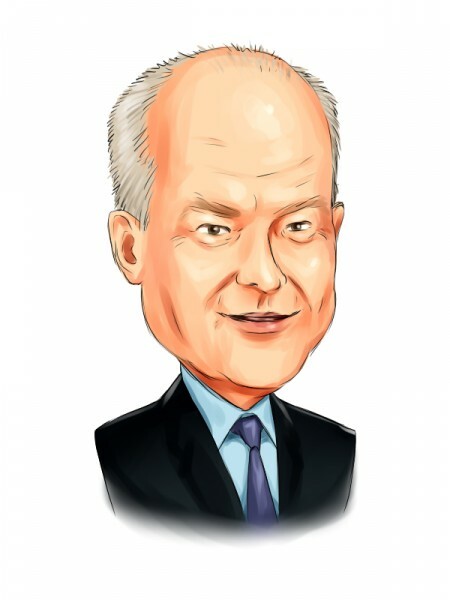 Activist Keith Meister Says This Year’s Market Rally and Last December’... Here’s What Hedge Funds Think About Principal Financial Group Inc (PFG... Is CNH Industrial NV (CNHI) A Good Stock To Buy? Is Liberty Broadband Corp (LBRDA) A Good Stock To Buy? Here is What Hedge Funds Think About Flocking Into ZTO Express (ZTO) Is Vulcan Materials Company (VMC) A Bargain According To Hedge Funds?